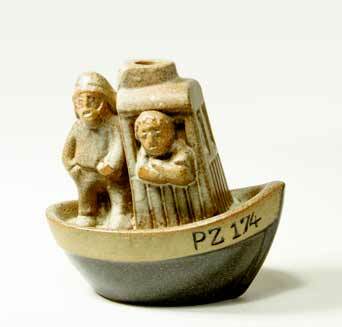 Tremaen fishing boat lamp base - 5½" (139 mm) long, 5¼" (133 mm) high. The hole for the light fitting is in the funnel and the hole for the flex is in the bow, just above the water line. Peter Ellery started Tremaen Pottery at Marazion, near Penzance, Cornwall, in 1965. He was not a potter, having been trained as an artist. In 1967 the company moved to Newlyn, four miles down the coast (or three miles if you swim across the bay). The workforce expanded to twelve. All Tremaen's work was done by hand, often using very unconventional techniques - Ellery explained that he had not been trained as a potter, so he had to make it up as he went along. The pots were fired once, for a short period at a fairly high temperature. On a whim, in 1988, Ellery decided that he had had enough of pottery, and left. He spent the last ten years of his life painting.